Although a big fan of New York style cheesecake, I always end up making no-bake cheesecake more often. It’s cool to skip the oven from time to time. While no-bake cheesecakes may seem a summertime kind of treat, they can work equally fine also in the winter. 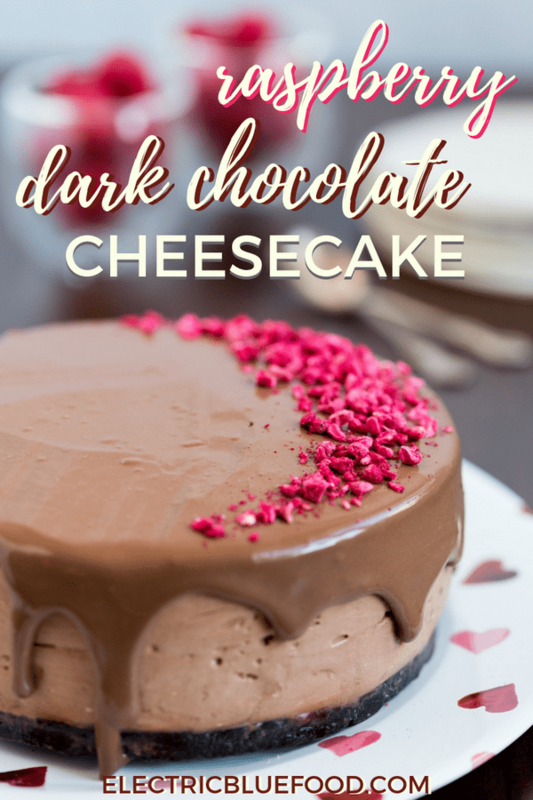 In this post I have a dark chocolate cheesecake with a raspberry filling. 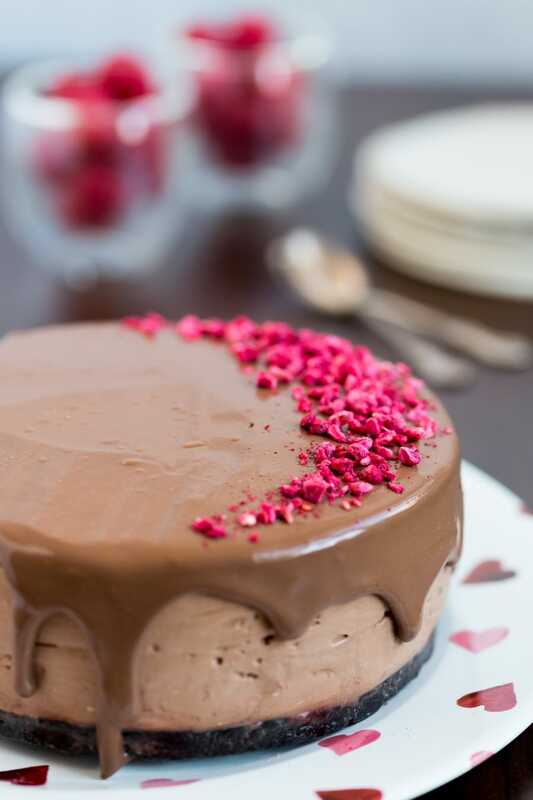 Raspberries and chocolate are a great pairing, and their intense flavours make this decadent chocolate raspberry cheesecake perfect even on a winter day. 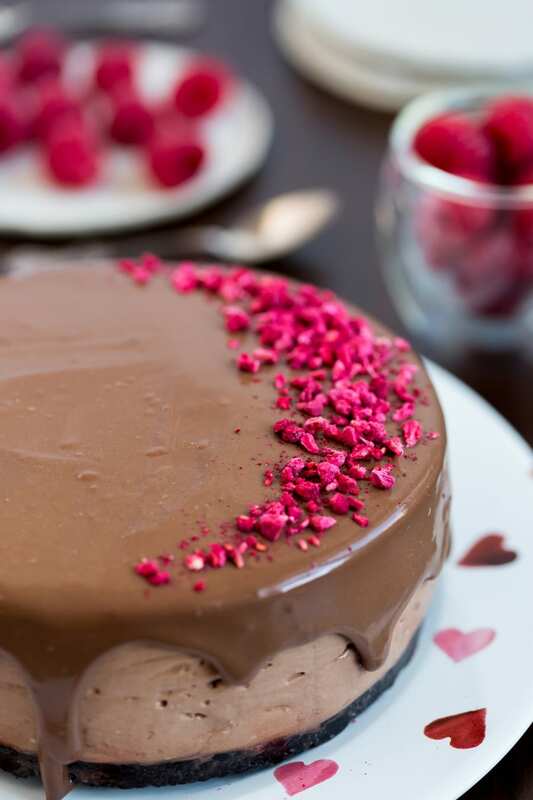 Valentine’s day is a winter occurrence and this cake kind of suits the festivity. Raspberries are not in season at the moment, of course. In this raspberry cheesecake I’m using raspberry jam, as well as freeze-dried raspberries for decoration. If you can get your hands on some imported and extremely expensive fresh raspberries, I warmly recommend getting those too, and serving them on the side. 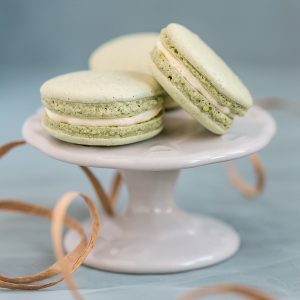 They complement the flavour of this cake by adding some wonderful freshness in an otherwise very rich bite. But if they’re absolutely not available anywhere, just go with jam and freeze-dried. It’s so wonderful we have many ways of preserving fruits for the time of the year when they’re not available. Not in a mood for chocolate? Try this raspberry-only no-bake cheesecake! 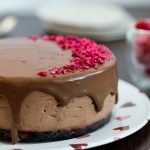 To make this chocolate no-bake cheesecake you need to use bitter chocolate. Go for 70% cocoa or more. Cheesecake alone is quite a flavourful cake even when made simple. Cream cheese has this peculiar tang, and if we’re adding berries, like in this case, we should really aim at balancing the flavour spectrum that would otherwise tend to the sour end. The cheesy notes are already partly toned down by using half cream cheese and half whipping cream. Dark chocolate complements the work adding a deeper bitter flavour. We all know how wonderful dark chocolate is with raspberries, after all, right? 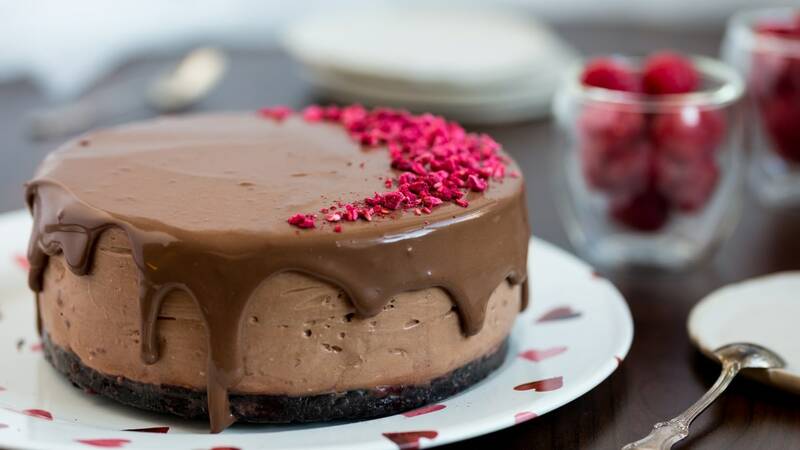 This dark chocolate cheesecake recipe has a subtle raspberry flavour. It’s found between the crust and filling, where I spread a very thin layer of raspberry jam. 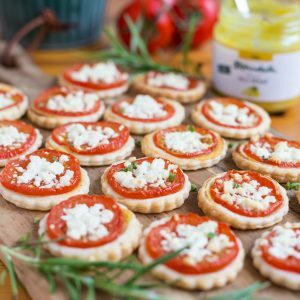 As simple as it sounds, this may be a tricky operation, as a too thick layer of jam may cause the filling to slide away from the crust once it’s hardened. So don’t use more than one spoonful of jam, and make sure not to spread it on the edges of the crust. The weight of the filling may already contribute to spread it further. This way the filling will seal the edges, not letting the jam work as a gliding surface. Oreo cookie lover? How about this Oreo no-bake cheesecake? 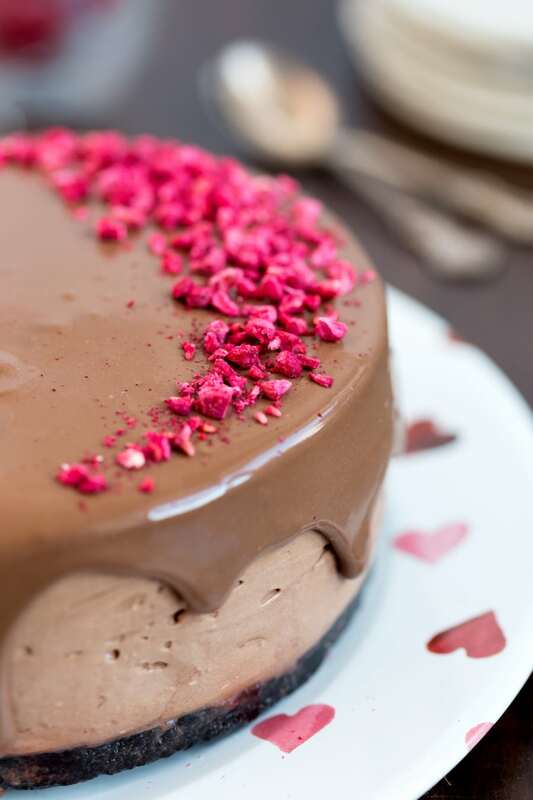 This cake is decorated with chocolate ganache and freeze-dried raspberries, for an even more intense dark chocolate and raspberry flavour. In the filling I like to use strong dark chocolate, 70% cocoa at least. This is to ensure the maximum flavour once it’s blended with all the other ingredients. 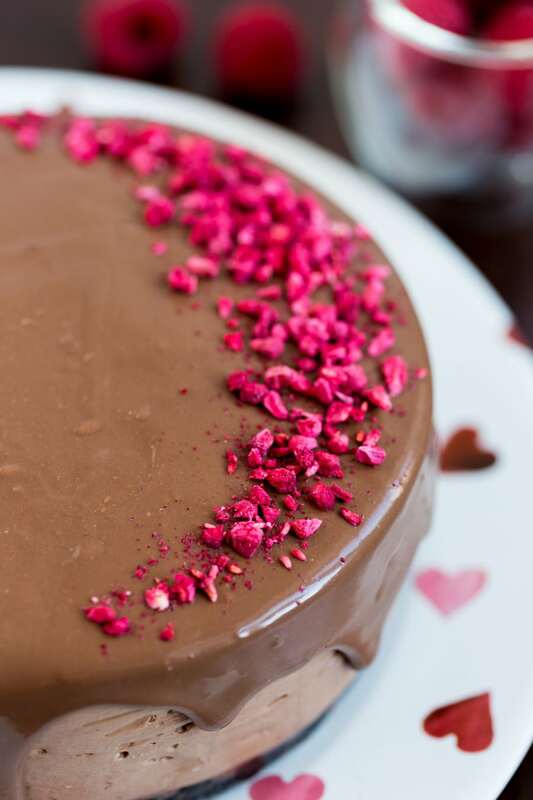 On the topping I use a slightly less intense chocolate – 50% cocoa or similar. You don’t want the ganache to be too bitter. The freeze-dried raspberries have this wonderful sour flavour that just adds a final touch – plus they have such a powerful aesthetic appeal – just look how they stand out on the chocolate brown. So beautiful. Looking for other ways to use freeze-dried raspberries? How about these raspberry choocolate balls, a true Swedish delicacy? Open each Oreo cookie and separate the biscuits from the filling. Place the filling in one bowl and the cookies in another. Crush the biscuits in a food processor. Melt the butter and add it to the crushed biscuits. Combine and spread the biscuit base over a springform pan. Place in the freezer for the time being. Melt the chocolate in a double boiler. I recommend the use of 70% dark chocolate for the best taste in the end product. In the bowl with the Oreo filling add the cream cheese and powdered sugar. Mix with an electric mixer at medium speed until combined. When the melted chocolate has reached room temperature, add that to cream cheese mix and combine. Soak the gelatin sheets in cold water until soft, for a couple of minutes. Warm up 100 ml of cream and stir in the soaked gelatin to melt. Combine with the rest of the cream. Slowly pour the cream into cream cheese and chocolate mixture, mixing at low speed. Stop when the mixture is even and combined. Take the crust out of the freezer and spread a thin layer of raspberry jam on its surpface, making sure to keep about 1 cm away from the edges. Pour the chocolate and cream cheese mixture on the crust and even out the top with a spatula. Place in the fridge and let set for a minimum of 2 hours (overnight is preferred). To make the ganache, warm up the whipping cream and take away from the heat just before it reaches boiling temperature. Crack the chocolate and add it to the hot cream. Stir until combined. Let sit until it reaches room temperature, the pour over the cheesecake, letting it gently drop down the sides. Decorate with freeze-dried raspberries. This looks so delicious! I’m saving it to make it as soon as possible!